If you want a sneak peek into what's coming up on Red Red, have a look at my I Could Make That board on Pinterest. It's a giant collection of all the tutorials I love, the crafts I want to try, and the beautiful products I feel confident that I could make myself. This lovely embroidery, by the merriweather council, is a fine example of the latter. Danielle's beautiful embroidered hoops are only 3" wide, though. I'm not that subtle. 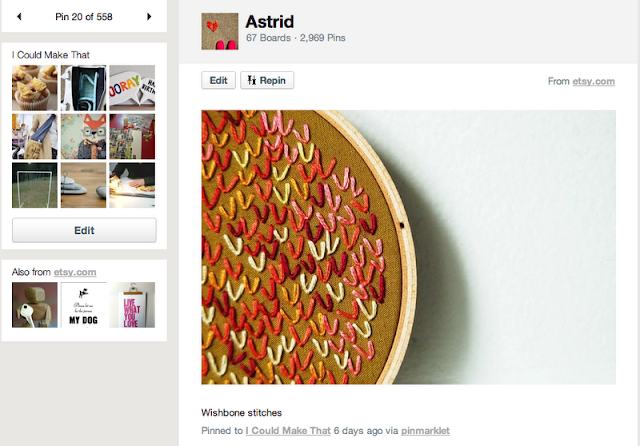 I set about making my own, inspired by the wishbone stitches, but on a much larger scale. A 15" hoop. What's that, a 500x enlargement? Hundreds of stitches. Reds, whites, pinks, yellows, oranges. And here it is, many hours later. Nowhere near as neat as merriweather's beauties, and much more work, but giant. Humungous. Texas-sized, you might say. Are you on Pinterest, too? Any favourite inspiring boards to share with us? We'd love to see! Wow, this is absolutely amazing! It must have taken ages and I can't even imagine all the colour changing and the precision! Fab job!